Regardless of health care setting, systems to prevent diversion must be given the highest priority. To help reduce diversion risk, it is important to design a comprehensive diversion prevention program focusing on multiple aspects of drug diversion and abuse. Education is a key component of any drug diversion prevention program. Health professionals often fail to understand their responsibility in preventing diversion to protect patients. All team members regardless of health care setting must clearly understand their roles in helping to prevent, identify, and report drug diversion. Health professionals must comply with protocols to help minimize unauthorized access or opportunities for drug diversion. Frequent auditing of CS processes is essential to deterring diversion and also facilitates early detection in cases in which diversion occurs. These systems can include active monitoring of pharmacy and dispensing record data, as well as raising staff awareness of and maintaining vigilance for behaviors and other signs of potential diversion activity. Drug diversion can occur at every point along the drug delivery system, including at the time of purchasing/ordering, while dispensing/administering, or at the point of care. A number of vulnerable areas exist within every system. For example, a key potential breakdown point that can lead to possible diversion occurs when only one nurse is required to sign in CSs at the time of delivery. If that is the case, the process should be revamped to reduce the risk for diversion. • Does one nurse administer more PRN medications than other nurses? • Are CS doses signed out but not documented? • Did a nurse medicate another nurse's patient? • Does a nurse report she/he was "too busy" or "forgot" to obtain a witness to waste the CS? • Does a nurse sign out a larger dose of a CS when the ordered dose is available, then sign that the remaining medication was wasted? • Did a nurse say she/he gave her/his CS access code to another nurse? • Do CS withdrawal times generally correspond to administration times? • Are patients reporting that the pain medication ordered does not relieve their pain on a nurse's shift? • Are there changes in the trends of a patient's response to narcotic therapies? • Is the CS count inaccurate when a particular nurse works? • Are CSs signed out for a patient who has no order for them? • Are times and amounts accurate for CSs signed out? • Do staff signatures/initials appear to be forged? • Do liquid medications have normal color, odor, and consistency? • Do CS medications or packaging appear to have been tampered with or switched? • increasing personal and professional isolation. Health care professionals often avoid dealing with drug impairment in their colleagues. This is often due to a lack of understanding of their roles in identifying the signs that a coworker or peer may have a problem. There is the fear that speaking out could anger a coworker, resulting in retribution or a colleague's loss of professional practice. Many employers or coworkers effectively become "enablers" of health care practitioners whose professional competence has been impaired by drug abuse. Addicted colleagues are often given lighter work schedules, and excuses are made for their poor job performance. Excessive absences from the work site are often overlooked. Drug impaired coworkers are frequently protected from the consequences of their behavior. This allows them to rationalize their addictive behavior or continue their denial that a problem exists. If you recognize the aforementioned signs or symptoms in a coworker, it's time to demonstrate concern. If you see something, you should say something. You may jeopardize a person's future if you cover up or fail to report your concerns. Many well educated, highly trained, and experienced health care practitioners lose their families, careers, and futures to substance abuse. Tragically, some health care workers have even lost their lives to their drug addictions because the people who witnessed the signs and symptoms of their drug use refused to become involved. By becoming involved, you may not only help an individual who may be doing something illegal, but more importantly, your action could affect the safety and welfare of your addicted employee or coworker and those patients or the public who may come in contact with him or her. For some individuals, having a supervisor talk to them about their poor performance is enough to initiate a behavior change. For others, however, the problem may be more severe and require more drastic measures. The threat of losing a job may exert more influence on a drug abuser than a spouse's threat to leave or a friend's decision to end a relationship. Many drug abusers will seek help for the problem if they believe a job is at stake. Treatment programs range from self-help to formal recovery programs. A number of state licensing boards, employee assistance programs, state diversion programs, and peer assistance organizations will refer individuals and their families to appropriate counseling and treatment services. To the greatest extent possible, these services maintain the confidentiality of individuals seeking assistance. — Mark D. Coggins, PharmD, CGP, FASCP, is vice president of pharmacy services for Diversicare, which operates skilled nursing centers in 10 states, and is a director on the board of the American Society of Consultant Pharmacists. He was nationally recognized by the Commission for Certification in Geriatric Pharmacy with the 2010 Excellence in Geriatric Pharmacy Practice Award. 1. Centers for Medicare & Medicaid Services. Partners in integrity: what is a prescriber's role in preventing the diversion of prescription drugs? 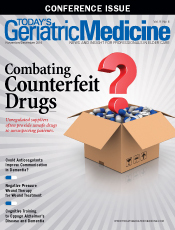 https://www.cms.gov/Medicare-Medicaid-Coordination/Fraud-Prevention/Medicaid-Integrity-Education/Provider-Education-Toolkits/Downloads/prescriberrole-drugdiversion-factsheet-082914.pdf. Published September 2014. Accessed October 1, 2016. 2. Prescription drug abuse: from the director. National Institute on Drug Abuse website. https://www.drugabuse.gov/publications/research-reports/prescription-drugs/director. Updated November 2014. Accessed September 30, 2016. 3. Prescription painkiller overdoses in the US. Centers for Disease Control and Prevention website. http://www.cdc.gov/VitalSigns/PainkillerOverdoses/index.html. Updated November 1, 2011. Accessed September 30, 2016. 4. American Society of Addiction Medicine. Opioid addiction 2016 facts & figures. http://www.asam.org/docs/default-source/advocacy/opioid-addiction-disease-facts-figures.pdf. Accessed October 2, 2016. 5. Drug Enforcement Administration. Drug fact sheet: hydrocodone. https://www.dea.gov/druginfo/drug_data_sheets/Hydrocodone.pdf. Accessed September 24, 2016. 6. Drug addiction in health care professionals. US Drug Enforcement Administration website. https://www.deadiversion.usdoj.gov/pubs/brochures/drug_hc.htm. Accessed October 2, 2016. 7. Nebraska Department of Health & Human Services. Alcohol and drug abuse and addiction: a health care professional's resource guide. http://dhhs.ne.gov/publichealth/Documents/Chemical%20Dependency%20Book.pdf. Published 2011. Accessed October 2, 2016.